The view I lived with in July 1999 was like nothing I have ever seen before or will see again: Axel Heiberg’s Geodetic Hills, pinkish and rounded, streaked with darker lines that mark the remnants of forests which once grew in the polar region. In that High Arctic world of 45 million years ago, a tall, lush forest flourished here. Then, the mean average temperature on Axel Heiberg was seven to 15 C.
Now, 45 million years is a long time ago, and it took time to wrap my brain around this when I was on Axel Heiberg. As I sat next to the stumps and logs from that era, near leaves which covered the forest floor so long ago, I would think: one million, two million, three million until I managed finally to move slowly back in time. The fossil remains were even more extraordinary because they weren’t petrified, or turned to stone, but mummified. The leaves and other bits of plants looked almost as fresh as yesterday’s. The stumps looked as if they were just cut down. 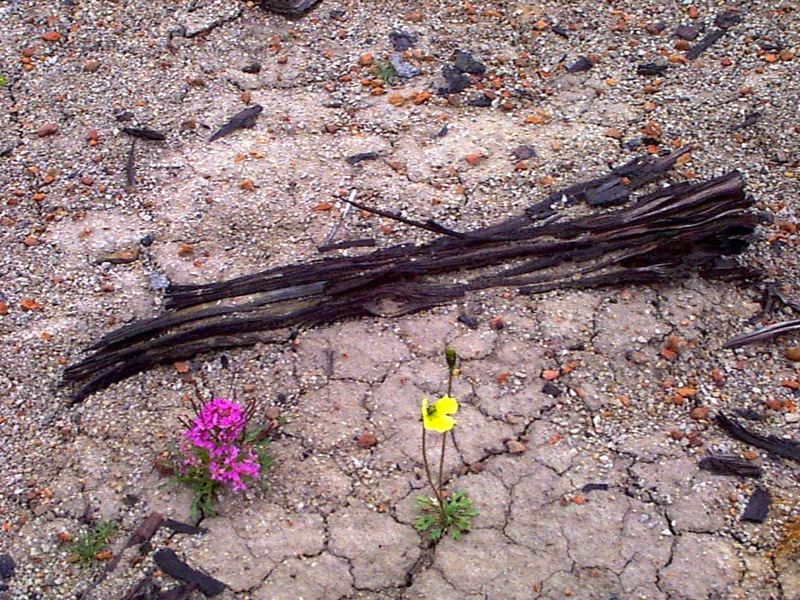 But these trees and plants, even though they’d been preserved for millennia by the cold, dry Arctic climate, were still delicate. They became brittle once they were exposed to the air by erosion. Any disturbance paved the way for even more erosion during the violent wind storms that regularly passed over the hills. 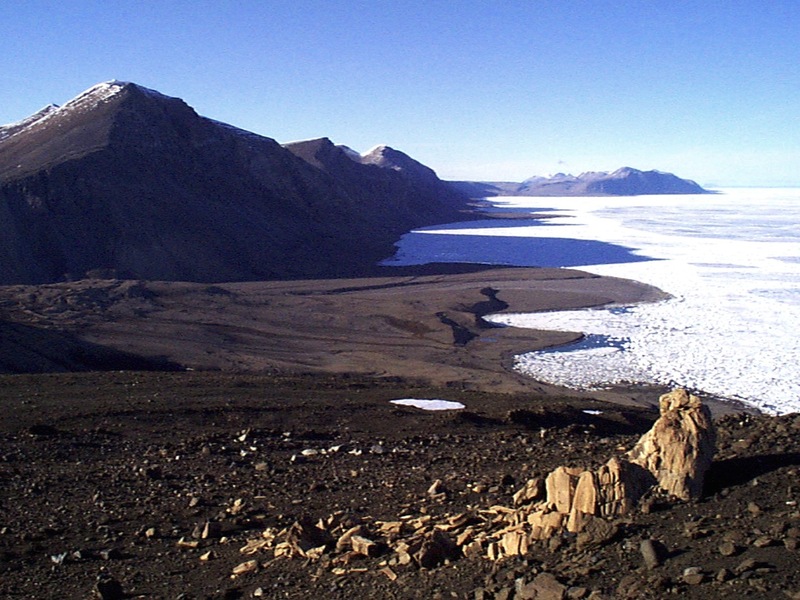 The fossil forest, located outside the borders of the national park on Ellesmere Island, was also unprotected from visitors. It was only a 20-minute hop by helicopter from the “listening” station at nearby Eureka on Ellesmere Island, and military officers and other personnel often came to check it out. Some were known to use the ancient wood for camp fires. Passengers from cruise ships also regularly toured the site in August and September. Some trampled the fossils or took pieces of wood for souvenirs. 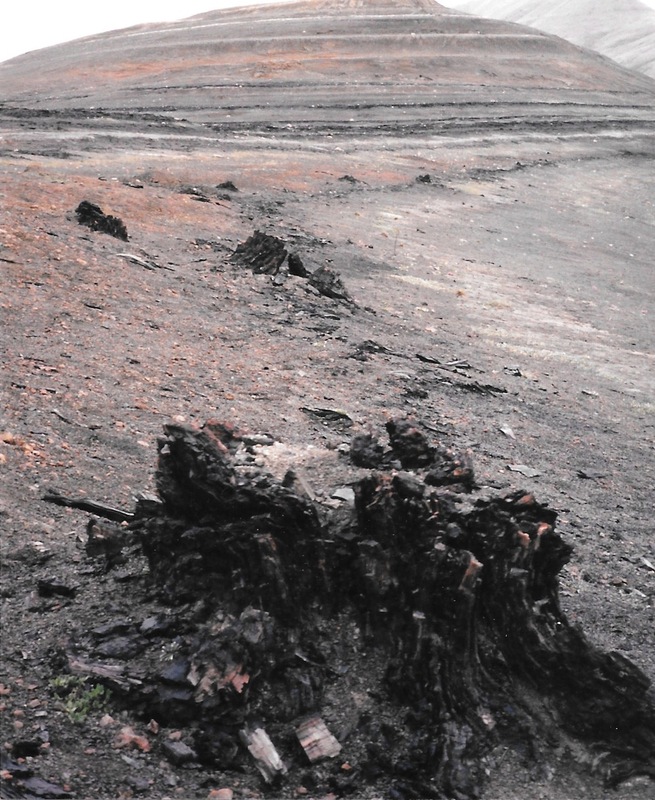 Of more than 200 stumps that were once recorded in one section of the fossil forest, fewer than half that number still remained in 1999. When I arrived at the fossil forest in late July 1999, the fossil forest was pockmarked with holes and trenches where a scientific team from the United States had been exhuming fossils and surveying with ground penetrating radar and global positioning devices. Team members came from the University of Pennsylvania, Johns Hopkins University and the University of Maine, and were all-American with the exception of one Canadian, a permanent resident of the U.S. They included a forest ecologist, a fossil plant biologist, a wood anatomist and geochemist who planned to look at how the ancient forest grew and see what it said about global warming. Their ranks also included a few strong-armed graduate students who described themselves as “diggers.” They had dug holes ranging from the size of giant-sized insect hills to trenches several metres long. The forest looked as if it had been hit by bombs. 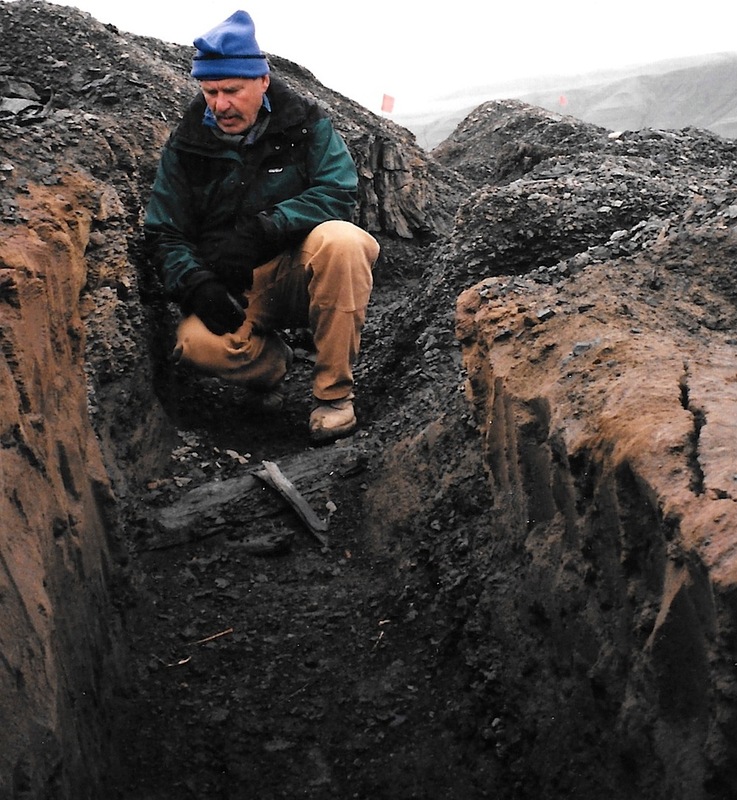 This digging, explained project leader Art Johnson, was necessary to measure specimens, look at sediments and provide data on the lay-out of the forest. Samples were to return to the U.S. where their atomic make-up would be analysed to reveal more about the atmospheric and environmental conditions the trees, mainly tall Dawn Redwoods, grew in. The Americans planned to recreate the growing conditions of these trees in growth chambers to learn more about how they could have adapted to the long periods of daylight and darkness in the past. During one of my many visits to warm myself up in their heated weather haven, plant physiologist David Vann suggested global climate change could be very rapid, with some scientists saying that the change could occur within a period as short as 20 years and kill billions of people. Vann said the project’s findings would likely show that the end results of global warming could be positive, despite rising sea levels and catastrophic storms — and that the “lungs” of the earth, its forests, would move north. “It would reassure people that when it’s all done, the world would be a nicer place,” said Vann. His words made me shiver. I’d been writing about climate change a bit, light fare such as sightings of robins in Iqaluit, but this was the first time I really think seriously about extreme climate change — something that the world won’t acknowledge until 15 years later. But in the fossil forest, in 1999, surrounded by those ancient remnants of a much warmer past, anything seemed possible. But, despite what the remains of that era could tell us, some Canadian researchers weren’t happy over the scientific dissection of the fossil forest. This surprised the U.S. team, particularly project leader Johnson. He maintained that the forest is just one small part of a much larger, equally interesting deposit in Axel Heiberg. Soon we had to leave. It had been snowing, and while my new down sleeping bag was finally warm enough that I dreamt I was in a sauna, it was hard to look for fossils in the snow. We packed up the camp and got ready to leave. Back in Resolute Bay, I had to say good-bye to my new friend Yusheng Liu, who taught me so much about fossils on Axel Heiberg. I knew I’d never see this patient teacher and good cook again. That’s how it was, although I’d enjoyed listening to him talk about his family or simply spending time hunting for fossils. 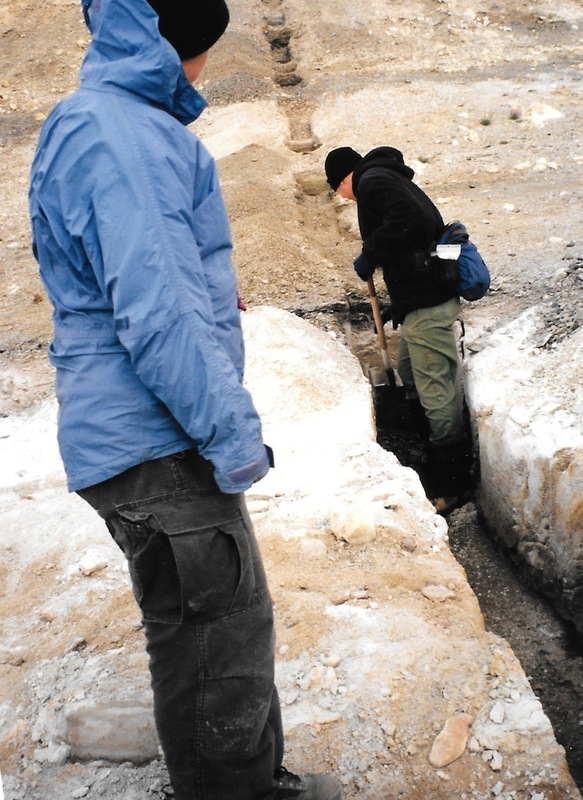 Jane George and Yusheng Liu in the fossil forest, July 1999. Nothing happened quickly to protect the fossil forest which even 15 years later remained not safeguarded. 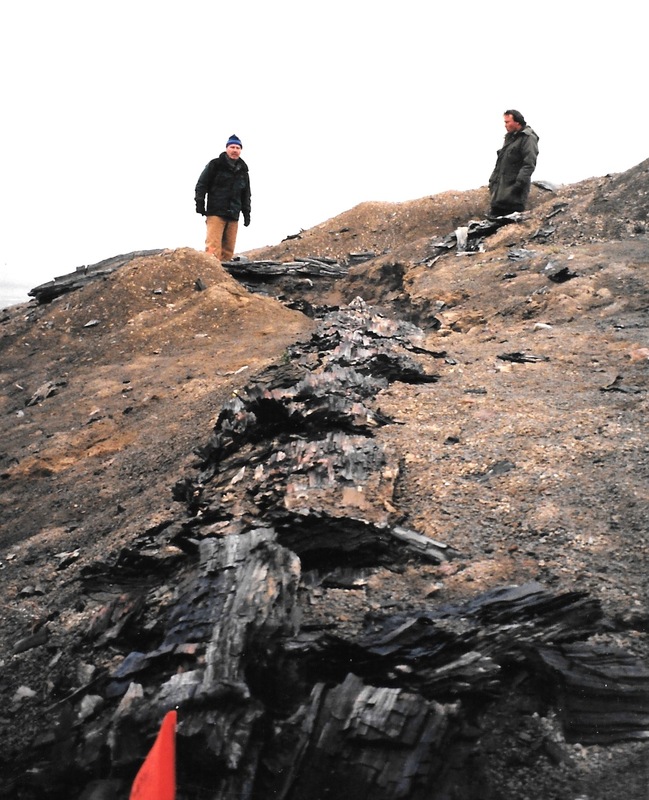 The following summer, in 2000, the Nunavut Research Institute, that issued the permits to the U.S. team, took some local politicians on a tour of the site, but that was more to justify its decision to let scientists tear up the fossil forest than to work on ways to protect this unique place for future generations. I waited for the Nunavut government to do something, which it finally did, but so slowly. The future territorial park gets a name at least: Napartalik, where there are trees. But the fossil forest remains too remote and too old to evoke much interest or money— particularly when the pressing problems of today are so large. 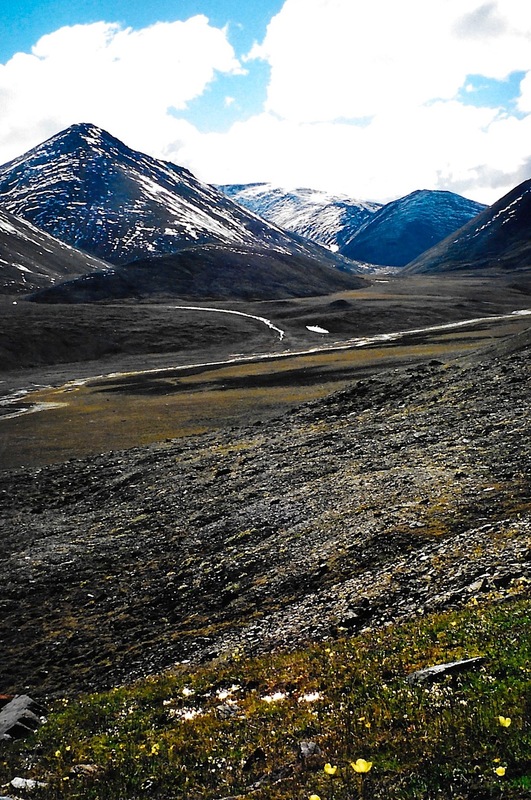 In July 2000, when I was once again in the High Arctic, I visited another ancient forest located near the tip of Ellesmere Island. Its stumps had petrified and turned to yellow stone. The stumps were located on a high slope located above the water, in a place that’s only accessible by the Geological Survey of Canada helicopter I was riding in. I could see over Nares Strait to the rocky cliffs of Greenland and across to mountainous coast of northern Ellesmere Island. Later, as I took a break from a hike on a mossy hillside in a deep valley, full of wild flowers and a sparkling stream, somewhere in northern Ellesmere, I was able to contemplate the strangeness of that petrified forest and the valley thousands of kilometres north of the tree line where flowers are now growing in the heat of the summer sun: how was it possible huge trees grew here? Was every day as beautiful, warm and sunny as this one and what does this mean about the world? These questions couldn’t be answered, but I would spend much of the next 10 years thinking about climate change in the Arctic. Later, as more extreme weather events are linked to climate change — and the world appears unable to agree on what to do — I wonder why, if scientists suspected catastrophic climate change was in store for the world 15 years ago, did no one act earlier or get the warning out? Like an iceberg continues June 2. Like an iceberg, 1997, “Qaggiq” cont.